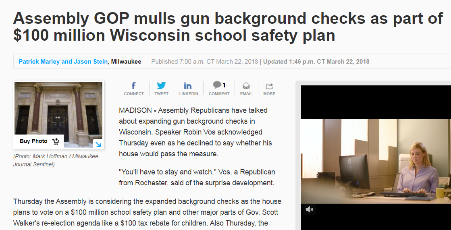 In the last two hours, the news broke across the state that the Assembly may try to sneak a major gun control agenda item in Governor Walker’s school safety plan! I need you to drop what you’re doing and take immediate action! You see, all session we’ve been battling against Universal Background Checks, Michael Bloomberg’s signature legislative goal for Wisconsin. This radical agenda item, as it’s normally written, makes it a felony for you to transfer any firearm without running the transaction through a federal background check first. And if you don’t, you would be a felon. If you give a handgun to your adult daughter without adding your name to a government list, you would be a felon. If you pass on family heirloom firearms to your grandson without adding your name to a government list, you would be a felon. If you let a friend borrow a shotgun for deer opener without adding your name to a government list, you would be a felon. We stopped this in the House, last month. And we stopped it in the Senate, just this week! Now, Speaker Robin Vos says the Assembly may move this legislation later today! Don’t take my word for it, read the story that is running right now all across the state. Please call them and email them right away! And when you’re done, please call your own Assemblyman. If you’re not sure who your Assemblyman is, please find out here. I don’t know about you, but with a narrow window of time to pass Constitutional Carry and Stand-Your-Ground law, I find it simply outrageous that the Assembly is trying to pass gun control instead! So please make your calls immediately! When you are done, I need you to join the Wisconsin Firearms Coalition today. We’re fighting around the clock in Madison to stop gun control and expose lawmakers who are supporting it. But we need your help. P.S. With just hours left in the special session in Madison, Speaker Robin Vos has announced that the Assembly may be taking action on Bloomberg’s gun control yet today! That’s why I need you to call the lawmakers listed above, right now! When you are done, I hope you will join WIFC immediately!